Bass Ball is the new album produced by Bunny Brunel and Stanley Clarke; and has been five years in the making. 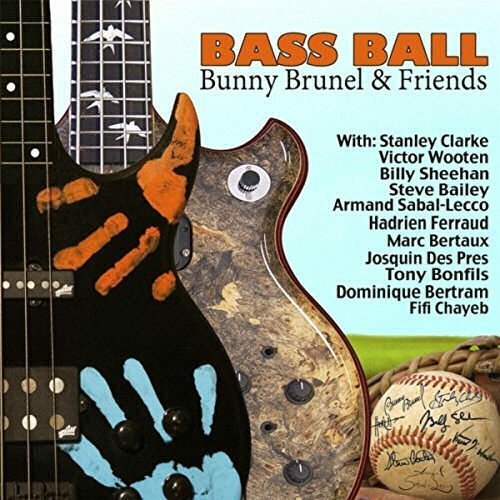 Bass Ball features Bunny and Stanley, as well as Billy Sheehan, Victor Wooten, Steve Bailey, Armand Sabal-Lecco (who also composed “Stand Out” on the album), and more. The album features many great players from all over the world, particularly from Bunny’s home country of France, including trombonist Alex Perdigon, trumpeter Eric Giausserand, bass players Tony Bonfils, Dominique Bertram, Fifi Chayeb among others. “Bass Ball” features a Who’s Who of drummers with Dennis Chambers, John Wackerman, Simon Phillips, Steve Ferrone, Johan Franzon, Ike Wiley, Clayton Cameron, and Bryan Cabrera. On Percussion are Chris Moraga and Monette Moreno. Playing keyboards on a few of the tunes is Nick Smith and Larry Dunn (Earth, Wind & Fire). Bass players are truly the focal point of this album, on which, Stanley plays Alembic basses, piccolo bass, and acoustic bass. Bunny Brunel plays the ESP fretted bass, fretless bass, and piccolo bass. “I like the fact that Bass Ball gives people an opportunity to hear some of the best bass players they’ve never heard before”, Stanley said of the production. Check out more the album here.